incorporate historic traditions into your own. Chances are you have eaten maple syrup at some point in your life. 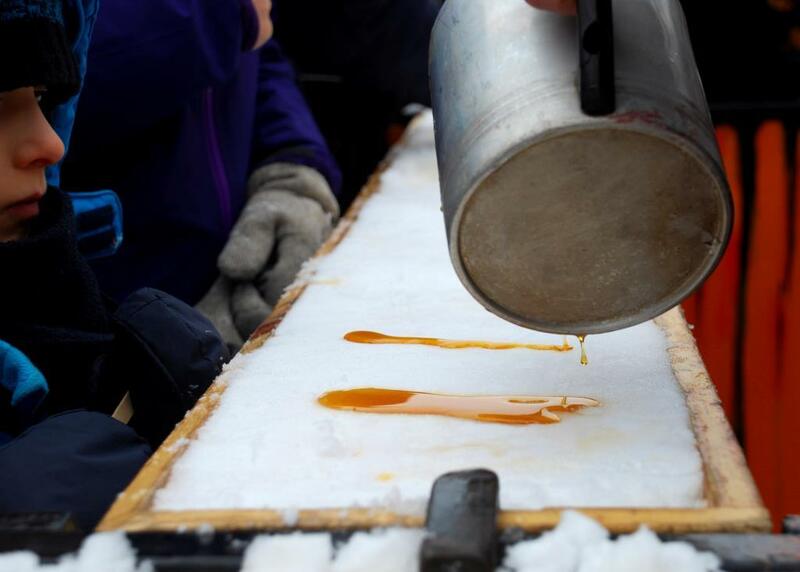 If you have lived through even part of a winter in Quebec, you have likely sampled maple taffy, too. Both amber-hued sweets are classic culinary elements of winter and early spring in eastern Canada and the northeastern U.S. Maple taffy has been a North American seasonal treat for over a century. It is also called “sugar-on-snow” and “tire d’érable” in Quebec, and “Jack wax” and “wax on the snow” south of the Canadian border. Authors such as Laura Ingalls Wilder immortalized the candy, writing of woodsy traditions practised by settlers in the late 1800s. In Little House in the Big Woods, Ingalls’ first book in the classic Little House series, Laura recalls making maple taffy. She described childish delight over the winter candy in such vivid detail that enterprising parents and imaginative children are still motivated to try it today. Sap in the sugar maple trees will be running soon, but if you still have maple syrup stored up from last year, you can make your own tire sur la neige any time. The following recipe was adapted from Sofya Hundt’s Girl’s Guide to Butter (www.girlsguidetobutter.com) and www.thekitchn.com. 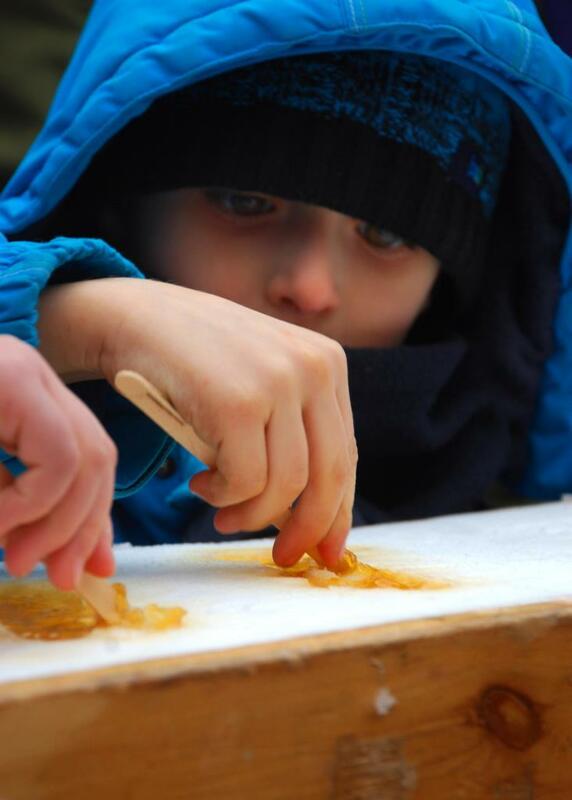 A key ingredient in any maple taffy experience is fresh snow. If the thought of using snow from a questionable source concerns you, some recipes suggest using crushed or shaved ice. Theoretically, any cold hard surface upon which you can cool the taffy will be adequate. PLEASE NOTE: Because the syrup becomes extremely hot, it can cause severe burns. Be careful to supervise any children involved in this project, and be very cautious. Place container of snow in freezer or outside, to keep cold. Heat syrup on medium-high heat until it boils. This will not take long. Boil for approximately a minute, and then start checking the temperature of the syrup with the candy thermometer. The syrup should reach the ‘soft ball stage’ (around 234 degrees Fahrenheit). Hundt said, “This means that, when you drip the syrup into the bowl of cold water, it should gel [into a ball or lump which you can handle. ]” If you prefer firmer taffy, heat the syrup a bit more – mere seconds. Continue testing tiny drops of syrup in the water until it reaches the texture you desire. Bring the container of snow indoors, or take the syrup outside. Carefully transfer hot syrup to the liquid measuring cup or ladle directly onto the snow. Allow taffy to harden for 20-30 seconds, then pick up with your fingers, or roll up on a popsicle stick or a spoon. For more ways to sweeten Valentine's with eco-friendly ideas, see my post on Foodies in Quebec (Love the Earth you’re with: 5 local tips to “green” your Valentine’s Day). Love the post, made me want to try it right now. I love the pictures most that show people's faces. ALWAYS great to add the faces, draws you into the picture more I think. I'm glad you enjoyed it! I did try it last winter, and honestly, it works. Give it a shot. Since I am off work today, I was planning a long x-country ski this afternoon. But, right now it's almost blizzarding! It'll be great for skiing when it clears though. I was actually thinking I should make some of that maple taffy you were writing about.....I don't have any maple trees, but I have organic syrup and LOTS of snow :-). Ahhhhh good ol syrup on a stick. Yum. Are you enjoying the Festival? Yes, carnival was fun this year. They had some weekend activities in some of the neighborhoods (like Limoilou) which were much more creative than the standard fare at the main site. The sleigh races were last weekend - those are always my favorite! Ah la tire à l'érable... Ça semble tellement lointain quand on a 25-30°C tout l'hiver ! Tu en as préparé pour vous ? Ça s'est bien passé ? Jerod ne s'est pas brûlé les doigts ? "then pick up with your fingers"... C'est vraiment ta stratégie ? Tu as du être une enfant très sage pour proposer ça. Attention aux brûlures !